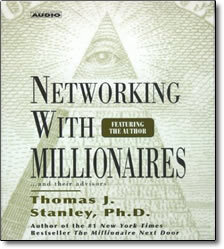 Networking With Millionaires – Thomas J. Stanley – CDs or MP3 – Discount! The affluent market segment is growing seven times faster than the household population in this country. Dollar for dollar the most productive way to penitrate the affluent market is to network with its members, their advisors, and the key members of their important affinity groups. What if you could discover ways to connect with companies and individuals who can easily afford your products and services? What if you could network and socialize the the most influential icons in your community? What would it mean to your business and your personal success? Learn how top producing marketers generate business by employing eight key networking themes. Learn how to personaly access the top business owners in your community. Networking is the essence of high performance marketing. It is professional selling at its highest form. Networking is about influencing the influential.